The way pediatric neurorehabilitation is provided to children with cerebral palsy is problematic in light of current knowledge of neuroplasticity. 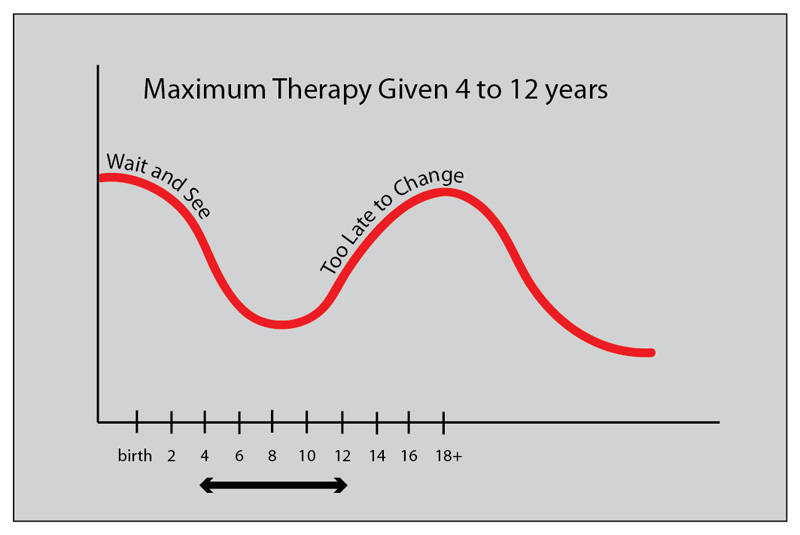 The maximum intensity of therapy is given in the middle years, completely MISSING the two peaks of optimum brain growth! There are two peaks of brain neuroplasticity in growing children: Birth to 4-6 years and 4-6 years during puberty. In the early years, many children who are missing developmental milestones are either not given an accurate diagnosis or told to “wait and see” how things develop. Often, the catchall diagnosis of Developmental Delay is given to buy time. A child who falls off a bike and has a head injury starts therapy early. An adult with a stroke starts therapy while still in the hospital bed. Some children with CP have no antecedent warning signs until they start missing milestones, but why not immediately refer them to an expert for diagnosis once a delay is detected? The situation is even worse for high-risk babies who were born prematurely or with complications at term birth. Most, if not all of these babies have had one or more scans and the doctors KNOW that there is brain damage. And yet, even with known damage, the only treatment plan for most is “wait and see and hope for the best”. In many areas, it is standard practice to delay the diagnosis of CP until 2 to 4 years and it may take even more time before the child is referred to a specialized treatment program. The delay for diagnosis and appropriate treatment is a real and widespread problem. The problem in the teenager and young adult is equally worrisome. There is a second burst of neuroplastic change as the child goes through puberty. It too is wasted, but there is a different reason. By this time, everyone agrees that the child has CP, but now it is apparently “too late to change”. This is WRONG and NOT supported by neuroscience research. Human brains are capable of change throughout life. The outdated philosophy of some neurorehabilitation specialists and therapists effectively limits the usefulness of the second burst of brain growth and neuroplastic change in puberty. As the brain matures, more function is possible, but re-training is needed. More research into methods to maximize the peak periods of neuroplasticity in our children’s growing brains needs to be done. Even if you have never signed a petition on Change.Org, please consider adding your name to this one and encourage all your all your friends and family to join as well. If there is money for research, the scientists will come. We all need their help to change the outlook for all children with early neurological disorders. I feel fortunate that my daughter, Mia, was diagnosed early at just 3 days of age as having had a stroke, and that I had a solid understanding of how plastic the brain is early. My attitude has been “Maximize the neuroplacity!” And, there are many signs of success. It’s time to register for fall gymnastics. Mia (turning 5 in June, stroke at birth) has been in a co-ed class since last fall for 3- and 4-year-olds. There are two options for the fall. E-Kids (co-ed, 4-5 yo) or Energy Girls I (girls, 5-6 yo). I wasn’t sure which would be best for Mia so I asked the gym to ask her current teacher. And, I am so happy that she thinks Mia is ready for Energy Girls I and could handle that level now even though she’s not quite 5! Mia loves her gymnastics class and doesn’t think of it as therapy even though it is very therapeutic with lots of weight bearing on both arms in all kinds of positions. Wow! This is important, so important. People can grow and learn all the way through life. No one is undeserving of opportunities to continue forward in life’s journey, possibly even finding at least one of their gifts to develop into a life affirming career, along the way. I am not really sure if this message will reach Dr. Pape, but I wanted to take the time to say how much I enjoyed watching and listening to your talk on brain recovery. CeCe had a L cerebral infarct inutero and later at the age of 8 a L functional Hemi at UCLA. So much of CeCe’s journey kind of makes a little more sense now. She also plays tennis and swims. She is in typical classes and Honors Western Civ (She is presently 8th grade). Over the years so many people from teachers to doctors have tried to set limits with CeCe, but CeCe has never limited herself. When they often wanted to limit CeCe’s assignments or have her draw pictures of what she had read instead of writing essay, I would ask how is this going to improve our writing skills? Studying using pretty much all of her senses with skipping smell has been key. She recently had an academic evaluation, and all were in amazement that her writing went from below average to high average. She advanced in all areas to minimum of grade level. When you are given this amazing gift, but the directions were not included, you tend to question every step. CeCe continues to develop and I kept waiting for the floor to fall below us. After watching you this afternoon, I am feeling the support of her floor more stable. Thanks for your dedication and appeal to all to change their mind set, CP is nothing but a diagnosis, and treatment should be available for all.